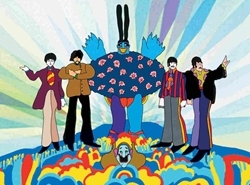 Beatles Film 'Yellow Submarine' Touched Music, Fashion — And Religion . Beatles Radio: The Beatles, Solos, Covers, Birthdays, News The Fab 4 and More! Not long after the British-made film landed in the United States, "submarine churches" attracted urban, young people. They adopted the outline of a yellow submarine with a small cross on its periscope as their symbol and displayed it alongside peace signs, flowers and other popular emblems of the 1960s.